The Clock Tower: what should happen now? 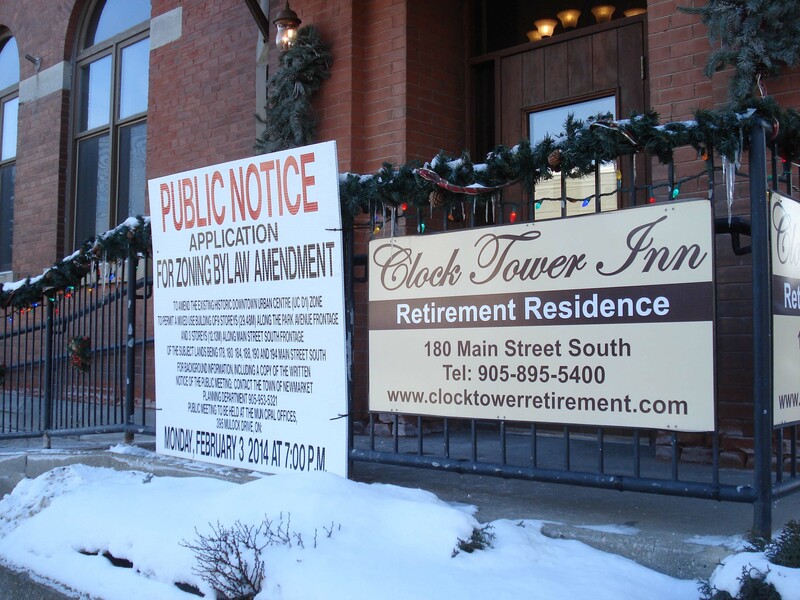 The decision by Bob and Colleen Forrest to sell the Clock Tower and the adjacent historic commercial properties should come as no surprise. Bob put the properties on the market years ago but, for whatever reason, he didn’t sell. Or couldn’t get any buyers. Now we must assume he is serious. His heritage properties are in a disgraceful condition having been boarded up and neglected for years. Rotting from the inside out is demolition by neglect. Colleen says the sums don’t add up and they cannot do anything with the properties other than get rid of them. But who is to say the Forrests will find a buyer at the price (whatever it may be) that they are prepared to accept? The Town’s Committee of the Whole will be considering its next moves on the Clock Tower on 29 April 2019. It is an important meeting and a lot will turn on the decisions made. So, what should happen next? And what questions need to be answered? 1. Invite Bob and Colleen Forrest to the meeting to give a presentation and take questions. They can explain why they have taken the decision to sell and bring us up to speed on Colleen’s promise of 4 May 2018 that they would be bringing forward an “exciting new concept for this beautiful heritage space, a concept that will bring economic stimulus to downtown Newmarket”. What progress, if any, did they make on developing their concept? 2. If the Forrests sell what responsibilities and obligations arising from the Town’s agreement with MSCI on 2 May 2018 will fall to the new owner? The lawyers will want to weigh in on this one. The land exchanges have been completed but what happens if the Forrests can’t sell - or won’t accept a lower offer - and they are still the owners on 15 December 2019 when, under the terms of the agreement, work is scheduled to begin on the old buildings with shovels in the ground. 3. Will we now have a report on the interiors of the buildings which have reportedly been allowed to decay into a truly horrible state? What heritage features from the interiors are worth saving? The fact that the buildings have been allowed to deteriorate so dramatically is not an excuse for demolition as some have mooted. Look at Bogart House which is to be brought back from the dead after an alleged heritage expert recommended it be demolished. 4. What are the Forrests planning to do with the interiors? They appear to be gutting the interiors. Is there an inventory of heritage features that should be left in-situ? Do they have all the necessary permissions from the Town? 5. 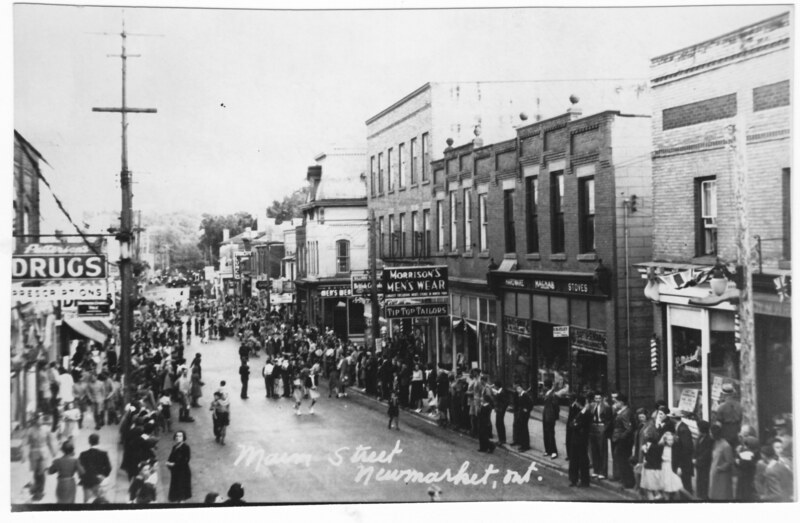 When do they intend to submit grant applications to the Newmarket Downtown Development Committee? Do they intend to ask for grant money for the interiors as well as for the facades of the heritage commercial buildings? 6. What works do the Forrests intend to carry out to make the properties ready for sale? 7. On 4 May 2018, Colleen talked about the problems with getting a servicing allocation to hook up the buildings to the sewage and wastewater system. She told the press: “...the planned Clock Tower condominium building would be unlikely to receive servicing allocation until 2026-27”. Understood. 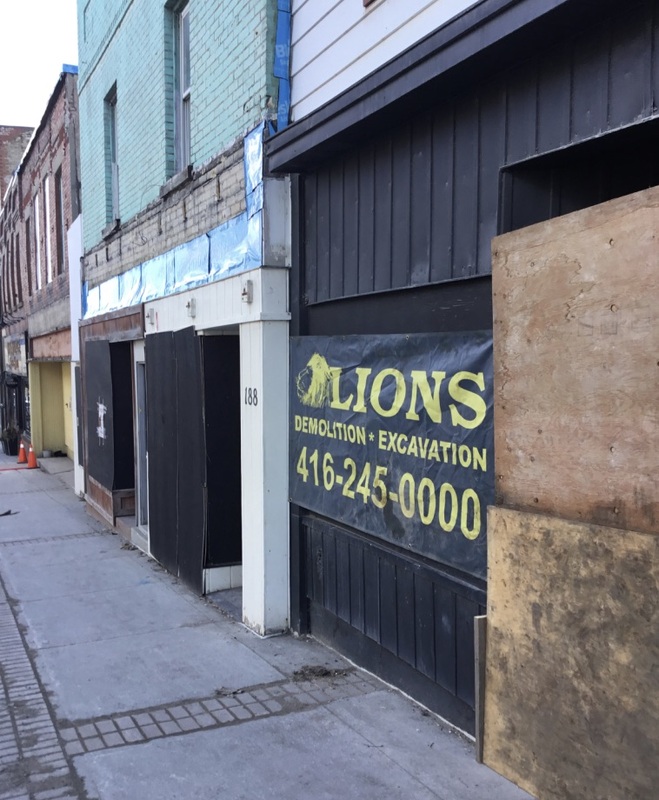 But are there any servicing constraints on any new development on Forrest’s land which is now, once again, part and parcel of the Downtown Heritage Conservation District? We shall find out soon enough. 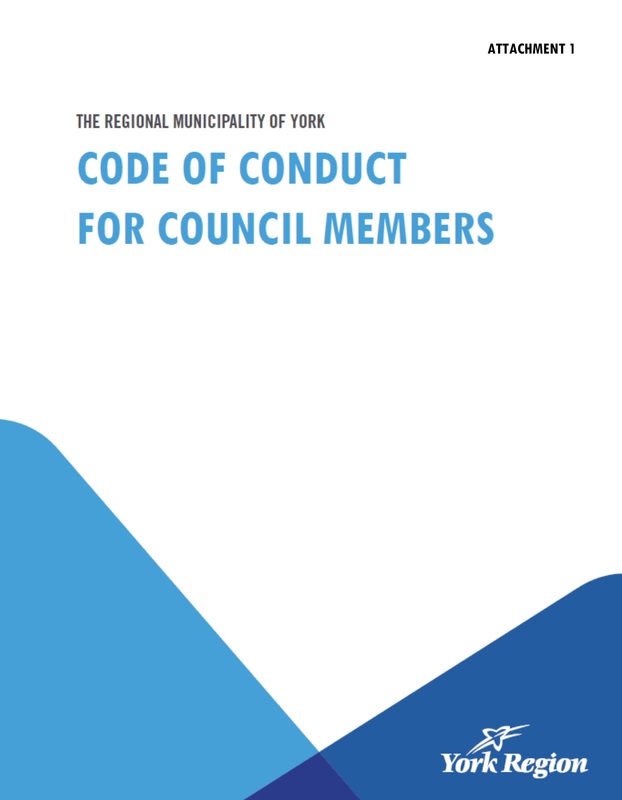 On Thursday (18 April 2019) York Regional Council will formally adopt its first ever Code of Conduct. It should have happened years ago but there was a lot of foot dragging. A Code of Conduct is a safeguard which protects the public from rogue councillors but it also protects the members themselves from unjustified accusations of inappropriate behaviour. The Regional Council has had a number of bites at a Code of Conduct and the one up for approval on Thursday is slimmed down from the January 2019 version by the Region’s Integrity Commissioner (another recent innovation). The Integrity Commissioner’s Draft Code was sent away for a re-write and the new version, authored I think by staff, is half the length of the original and is much better in every regard. It seems to tick all the boxes but you can never be entirely sure it will capture all eventualities. People are endlessly inventive when it comes to circumventing rules. As a general rule, if elected members are happy to read a report about their activities appearing on the front page of their local newspapers there is probably nothing to worry about. Before he was indirectly elected to the Chair of York Regional Council in December 2014 Wayne Emmerson had been Mayor of Whitchurch Stouffville for many years. And by virtue of that position he was also a member of York Regional Council. When he retired as Mayor he collected a severance package from Whitchurch Stouffville reflecting his many years of service including 17 years as Mayor. Emmerson said that he standing down as Mayor and coming off the local council because he was going to run for Chair of York Region. He couldn’t be Mayor of Whitchurch Stouffville and Chair of York Regional Council at the same time. He said that if he was successful in becoming Regional Chair it would trigger a by-election back in his home turf which would cost the taxpayers in Whitchurch Stouffville a pile of cash. He thought that would be a waste of their money. Emmerson, facing an electorate of 20, successfully stood for Regional Chair against Newmarket's John Taylor. 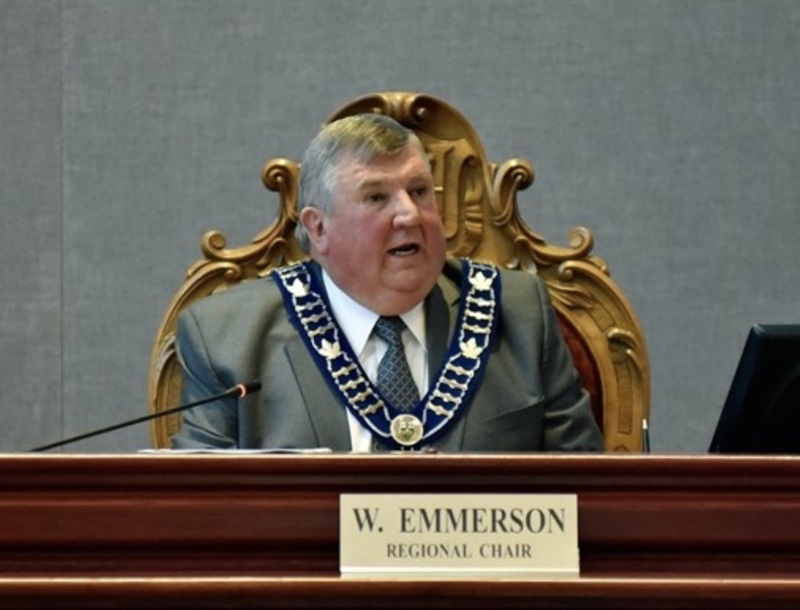 At the same time Emmerson collected a severance payment of $35,514.64 from York Region on the grounds he ceased to be a member of York Regional Council on election day on 27 October 2014. But he became its Chair on 11 December 2014. He was back on York Regional Council without having missed a single meeting – at the same time as everyone else who was re-elected - and with a wodge of dollar bills in his pocket. Severance, to me, suggests cutting ties. Going off and doing something else. Hence the rationale for the pay-out. But staying on and pocketing the cash? But I suppose that’s why we have Codes of Conduct and Integrity Commissioners to help us navigate our way through these difficult ethical dilemmas. Unfortunately, York Region did not have a Code of Conduct nor an Integrity Commissioner in December 2014 so it was up to Emmerson himself to decide what to do. Severance has to be claimed. It is not awarded automatically. Perhaps it would have been more appropriate for Chairman Emmerson not to have claimed his York Region severance payment of $35,514.64 until he knew the result of the election for Regional Chair. After all, he had six months to make that call. If he had lost to Taylor his connection with York Regional Council would have been well and truly severed. No doubt about it. But Emmerson had teed up the votes and won 16-4. And he collected his severance as a bonus. What Emmerson did was clearly lawful. 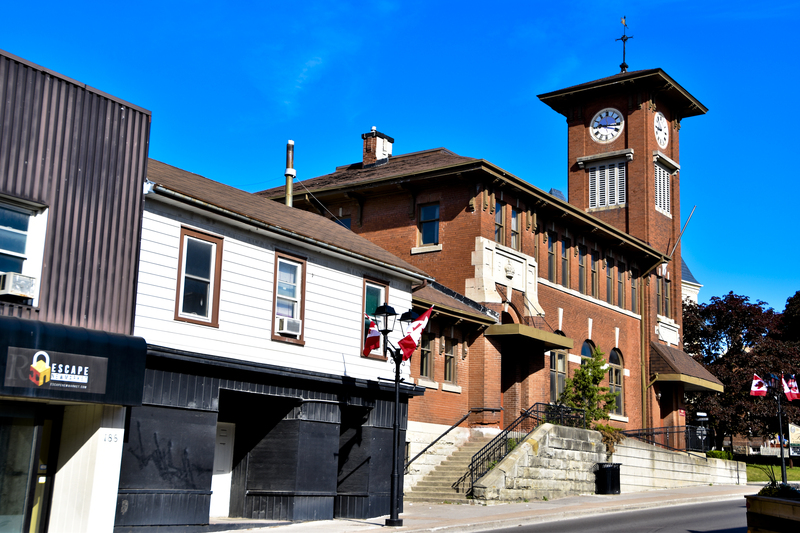 5pm: Developer Bob Forrest is putting Newmarket’s iconic Clock Tower and the adjacent historic commercial properties up for sale. The sale is being handled by realtor Graham Purvis of Royal Le Page but the listing is not expected before June at the very earliest. The agreement entered into by the Town and Forrest’s Main Street Clock Inc last year still stands and Forrest will be getting the properties in a fit state for sale. They have been empty for many years and the buildings have deteriorated markedly. A report on the Clock Tower is expected to go up to the Town’s Committee of the Whole on Monday 29 April 2019. 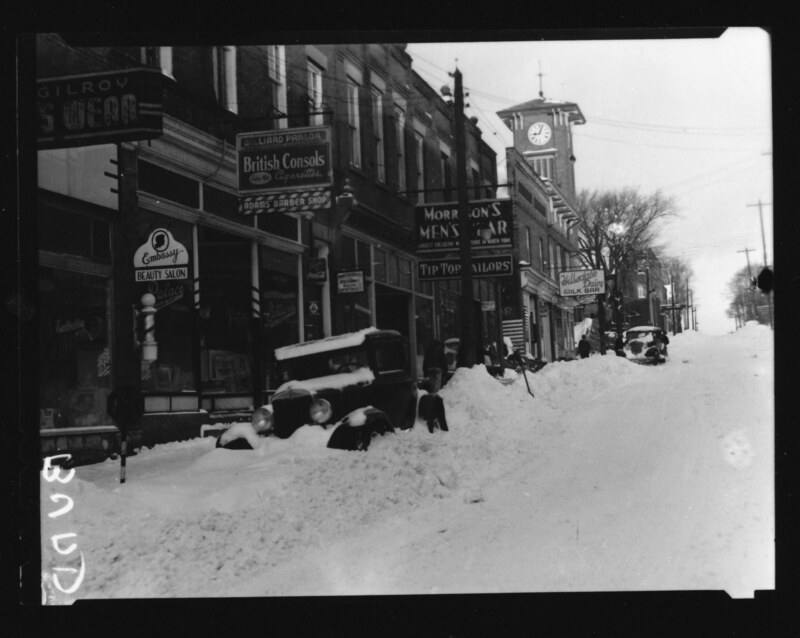 All Forrest's buildings are within the Downtown Heritage Conservation District and the structures are protected - other than the old telephone exchange dating from 1957 (on the Market Square side of the Clock Tower building) which has no heritage value. It appears the interiors are being stripped out. Update on17 April 2019: And this is how Newmarket Today subsequently covered the story. 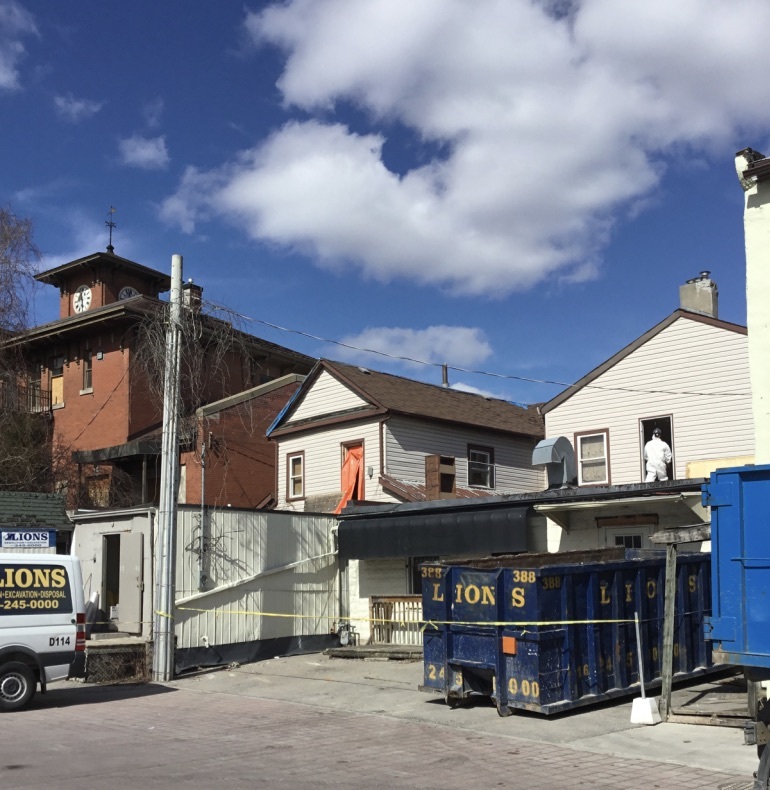 "Main Street Clock Inc looks forward to sharing in the near future an exciting new concept for this beautiful heritage space, a concept which will bring economic stimulus to downtown Newmarket." It never happened. We didn't get an exciting new concept. Just another 12 months of dereliction and decay. The Mayor, John Taylor, first learned of Bob Forrest's plans to sell the Clock Tower about two weeks ago. Faisal Hussain on the Danforth. Killing people. Newmarket-Aurora’s Liberal MP, Kyle Peterson, now supports a ban on assault weapons. But Kyle, who is standing down at the next election after one term in Ottawa, is still undecided about what to do about handguns. He told me last October he was going to wait for the report by Public Safety Minister, Bill Blair, before deciding which way to jump. I have been pressing Kyle, whom I like, to come out strongly and unequivocally in favour of a ban on handguns and assault weapons. As an MP he is in a uniquely influential position. He can shape, mould and lead public opinion so his views matter to me. But Kyle sticks to his guns. He is going to wait for Bill Blair’s report. Last Thursday (11 April 2019) the Government published a report on the firearms consultation which seemed to suggest the country was sharply polarised on a firearms ban. This was the narrative universally reported by the Canadian press from coast to coast. The gun-lobby got the headlines it wanted. The full report was not posted on the publicsafety.gc.ca website until after the day after the story was reported by the media. The consultation is deeply flawed. The on-line questionnaire, purportedly completed by 134,917 respondents, is completely bogus and its findings worthless. This concern was not addressed or rebutted in the report, merely acknowledged. I hope the Globe and Mail will get back to Bill Blair for a comment on his useless on-line survey. Why should people place any faith in a survey that can be so easily manipulated? In the report’s section on data collection and analysis I read that 1,103 responses were sent via email, 58 were sent via mail, and 8 were sent via fax. How many people like me emailed Bill Blair with their views without realising their comments would not be taken into account? I sent two emails to Bill Blair on 11 October and 3 November 2018 and did not receive a reply to either. Yet in this early period when I was struggling to understand the process for consulting the public, 134,917 on-line questionnaires were completed during the consultation period between October 11 and November 10. We learn no questionnaires were completed in PEI or the Territories. Wasn’t that a red flag signalling defects in the consultation methodology? We don’t have the numbers or percentages of questionnaires completed in Nova Scotia, New Brunswick, Newfoundland and Labrador, Manitoba or Saskatchewan. Why not? If the results can be extrapolated across the adult Canadian population as a whole (the very idea is risible) we are asked to accept that 81% of Canadians believe nothing more should be done to limit access to handguns and 77% believe no more should be done to limit access to assault-style firearms. The questionnaire was, of course, completed before Christchurch. But I suspect the “results” wouldn’t have been that much different had the questionnaires been completed after the massacre in New Zealand. The gun lobby is not open to persuasion. 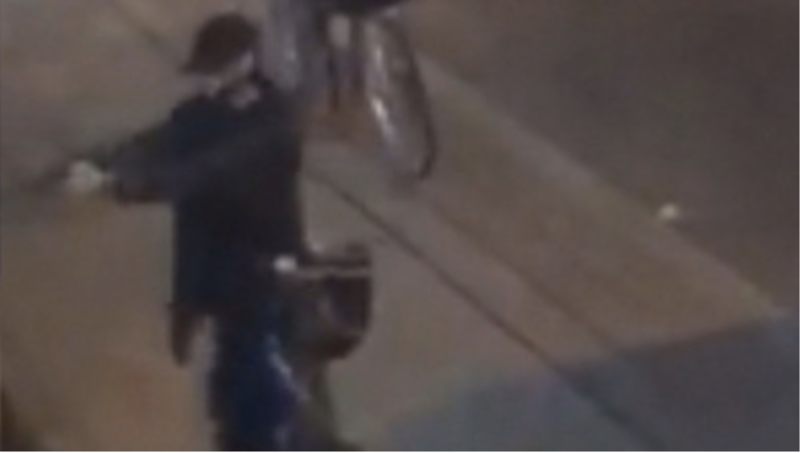 When I was cajoling Kyle to come off the fence last October I asked how he would respond if a deranged individual shot and killed half a dozen people in Upper Canada Mall, using a handgun. I wanted to know if Kyle would tell the press and public he would be waiting for Bill Blair’s report before commenting. Seems to me we’ve got to move away from the usual bromides and platitudes we hear after gun massacres. Please, no more “thoughts and prayers”. We need tough new laws to ban all hand guns and assault weapons in private hands. Which begs the question what are you going to do about it? There is a hive of activity today down at Bob Forrest’s historic Clock Tower properties on Main Street. Men in white overalls and face masks are heaving stuff from the property interiors into skips for construction waste. The historic properties at 180-194 Main Street have been boarded up and neglected for ages. But though they are gently mouldering away they are still liable for property taxes of around $42,000 a year. Bob has been shelling this out year after year but I suppose it is small change for him. What the Town gets in taxes with one hand it generously pays out in grants with the other. As part of the deal struck with Bob Forrest’s Main Street Clock Inc last year, Forrest is eligible for grants of up to $100,000 to help bring the property facades up to scratch. The matter was on the agenda of the Newmarket Downtown Development Committee on 29 March 2019 and drawings were available for members to view but these were not given out. My spies tell me the application was for the facades and interior renovations of the historic commercial buildings at 184-194 Main Street South. The Clock Tower building itself did not feature. The application was deemed to be incomplete and it was deferred to a future meeting. But how on earth did it get this far when we haven’t yet seen the so-called “New Development Concept” when it was promised “in the near future” on 4 May 2018. It seems to me Forrest is putting the cart before the horse if he is requesting cash from the Town before we have had sight of the New Development Concept. How do we know if it qualifies and meets program criteria if we haven’t seen it? Has the Town seen the New Development Concept? Has anyone asked for sight of it? This is happening, for goodness sake, under our noses in the very heart of the Town's Heritage Conservation District. Have we gotten too used to the sight of these empty and decaying buildings? Are they now just a familiar part of the streetscape? Why can't the Director of Planning write an Information Report tomorrow and tell us what's happening?